Today, 7/30 at 8pm, Barnes & Noble is hosting a FREE special Countdown to Midnight Party leading up to the release of Harry Potter and the Cursed Child Parts One & Two, a special rehearsal edition script book, which goes on sale 7/31 at midnight. The party will feature a special Muggle Wall where customers can share their favorite memories of Harry Potter as well as amazing giveaways and fun activities! Wristbands for the Midnight Release of Harry Potter and the Cursed Child Script Book will be distributed at 7 pm on July 30th. Limited Edition print winners will be announced at 11 pm. 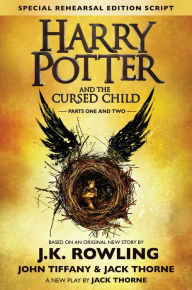 Order Harry Potter and the Cursed Child on hardback for $17.99 or Nook $14.99.